Whoever the Phleger’s were, they had fine taste in terrain. 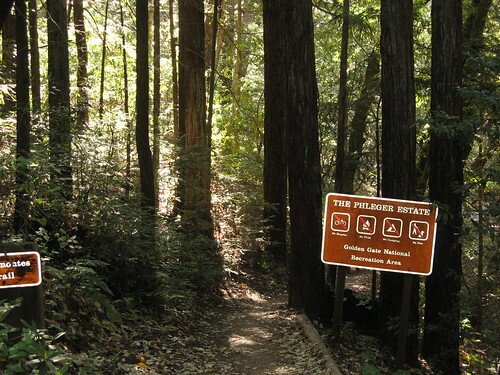 The Phleger Estate, now safely in the hands of the National Parks Service, has some of the best trails through redwoods in the Santa Cruz Mountains. It’s very remote — I saw a few people on horseback but no other hikers — and often there’s nothing out there but you and the sound of the breeze making the trees creak (which is a bit creepy). Phleger Estate is remote because you have to hike at least a mile just to reach its borders; once you’re inside, a mere 5.5 miles of trails await. You can easily do them all in one trek. To get there, you either hike in from Huddart Park (park at the Zwierlein Trail Head, find the Crystal Springs Trail and follow the signs); or park at Purisima Creek Redwoods Trail Head on Skyline Boulevard (not the big main lot; it’s the smaller one a mile or so to the south), cross the road, and follow the signs. 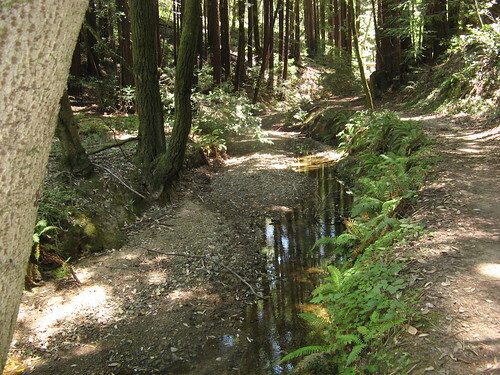 Miramontes Trail from Huddart Park tracks a riparian corridor along the Union Creek for 1.4 miles — goes in and out of redwoods along the way. Lonely Trail from Skyline boulevard goes 1.5 miles — very steep in places, but has a couple nice benches along the way. Great biological diversity. 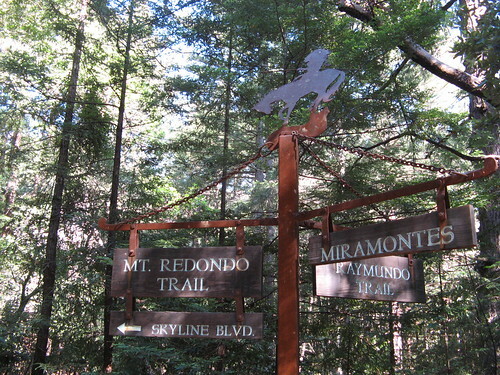 Raymundo Trail connects from Miramontes; at 1.6 miles, it tracks the Union Creek, then heads uphill. One of the best redwood trails outside of Big Basin. Mount Redondo Trail is .6 mile — much like Raymundo, but shorter. The must-hike loop: Reymundo and Mount Redondo trails — around seven miles regardless of which way you hike in. If you’re feeling stronger, hike up to Skyline Boulevard from Huddart and return via Phleger, taking Lonely Trail to Reymundo Trail for max distance, and you’ll net about 10 miles. 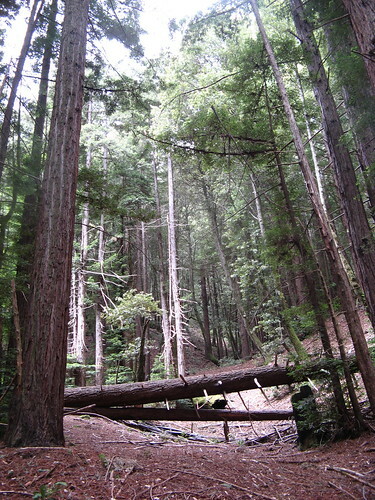 My hike started at Huddart, went straight to Phleger, took in all the trails and returned; also about 10 miles. The one nice thing about a Huddart start/finish: running water and real bathrooms (less nice: $5 to park). The terrain is not that much different from Huddart Park as you enter the estate, but it just feels prettier, quieter, nicer. More redwoody. More wild honeysuckles, which I also spotted last week at Huddart.Winehiker Russ tells me these are stinging nettles. The trail signs are very cool. A standard towering-redwood scene along the Lonely Trail. Lonely Trail was in many ways the least interesting of the trails at Phleger, but I did see this very nice iris growing right next to the trail; usually they hide close to the ground but this one was totally exposed and growing on a foot-tall stalk. Goes to show some of coolest things can happen on the less-than-cool trails. 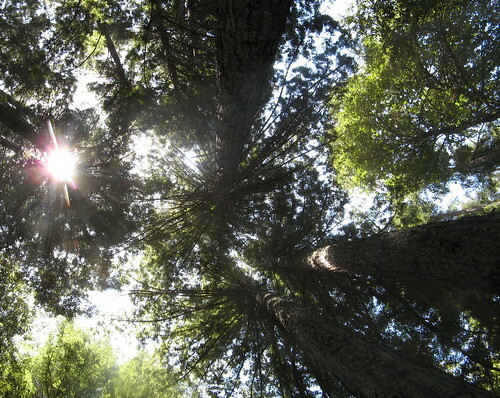 Redwood forest canopy is always cool. A look at the riparian corridor along the Miramontes Trail. If you’re looking for a short outing, just hike over here from Huddart and wander along this trail till you feel like turning back. An excellent bit of strolling. More on the estate’s history here. Trail map from the NPS here (note, it’s a PDF). Nice trip report, Tom. I need to return to Phleger soon – maybe with Calipidder (and you?). Just a note about that “honeysuckle”: your photo shows a stinging nettle that is, nevertheless, quite gorgeous when it’s flowering. Russ, thanks for the ID on that flower, it didn’t seem like it was the same shape as the honeysuckle, but it was the sam color. Good to know what a stinging nettle looks like, though. 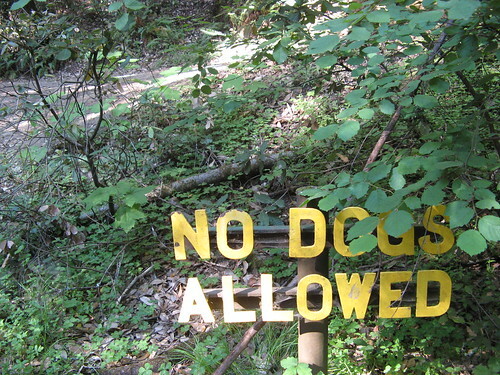 Those things are a bear … they go right through nylon hiking pants. I’m afraid it’s not a stinging nettle either, but a dead nettle. Stinging nettle flowers look like a bit of pale green rope hanging from the leaf axils. 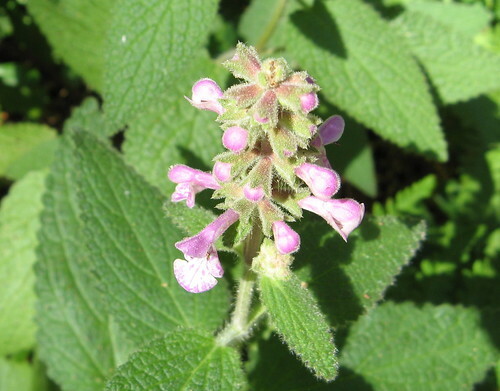 Dead nettles have showy flowers, usually in white or pink, like in your photo. 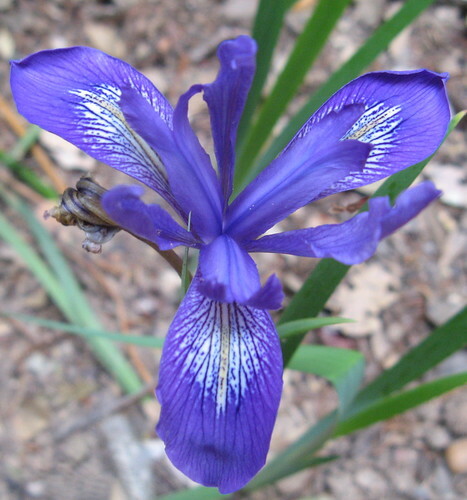 They’re often grown in gardens in shady locations. A bonus is that they don’t sting. Dead and stinging nettles are not actually related in any way, they just happen to look similar to the lay person. When they’re not in flower you can tell the difference in two ways: stinging nettles have a distinctive, nettle-like smell and dead nettles have square stems.